BEACON FALLS — One cold night seven years ago still stands out for Tony Moutinho as the peak of his 17-year career as Woodland High’s boys soccer coach. It was Nov. 8, 2011, and the Naugatuck Valley League championship finally got underway after long delays caused by a freak snowstorm. Those Hawks were the best team Moutinho ever had after years of being an NVL doormat. With a 1-1 score in the waning minutes against Watertown, Moutinho’s son, Matt, connected on a header that stood as the game-winning goal in a 2-1 championship victory. It stands as the only league title in program history. “My son scored the winning goal — that was the highlight,” Moutinho said. 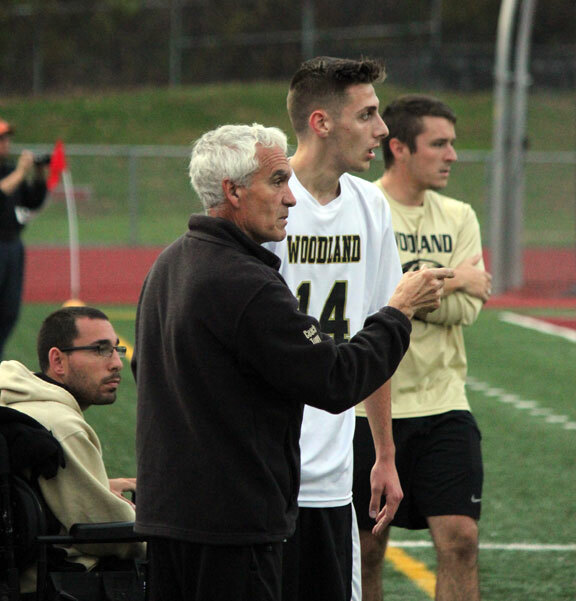 Moutinho reflected on his coaching career last week after he announced his retirement from the helm of the Woodland boys soccer program that he created. Moutinho said a change in his full-time job necessitated his stepping down, but he had mulled retiring for the last few years. Moutinho told the team about his plans before the Hawks faced Watertown in the NVL final on Nov. 1. It was the third championship berth for Woodland in the last seven seasons. Although Woodland suffered a 2-0 defeat to the Indians on that night, Moutinho’s final season with the Hawks was another successful one with a 14-3-3 record. The success of the last few seasons stands in contrast to the growing pains during the program’s first decade. It was a slow climb up the NVL standings — the Hawks didn’t even reach the nine-win mark until 2008, seven years into the program’s varsity existence. But the slow progress didn’t deter Moutinho. Moutinho originally landed the job thanks to his background in the soccer-loving community of Prospect. Moutinho hopes that assistant coach Kenan Collins, a social studies teacher at Woodland, will be his successor. “He’s a great kid, so I thought it would be a good time now,” Moutinho said. Moutinho admitted, though, that he almost second-guessed his decision to retire. Moutinho said his coaching experience was enriched and extended by his positive experiences with nearly all of his players and parents.